"I will start my operations here, and pull the rebels apart piece by piece. They'll be the architects of their own destruction." Two of the Star Wars galaxy's greatest admirals join the heated fleet battles of Star Wars™: Armada with the game's seventh wave of expansions. 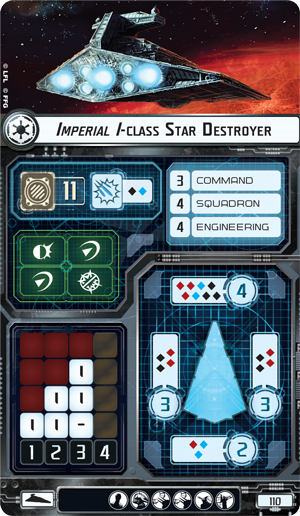 Even as its new ships, squadrons, and upgrades blast their way onto the battlefield, Armada Wave VII provides two new commanders—one Rebel and one Imperial—who are both more than capable of leading their forces to victory. Rebel players gain the services of the blunt and pragmatic Admiral Raddus, whose leadership ensured the Rebellion successfully retrieved the Death Star plans from Scarif, and fans of the Galactic Empire can savor the long-awaited arrival of Grand Admiral Thrawn! "I studied the art of war, worked to perfect it." 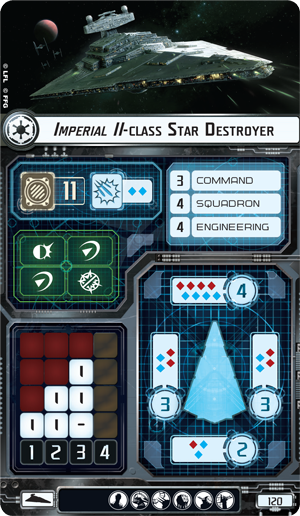 In Armada, you assume the role of fleet admiral, serving with either the Imperial Navy or the fledgling Rebellion. 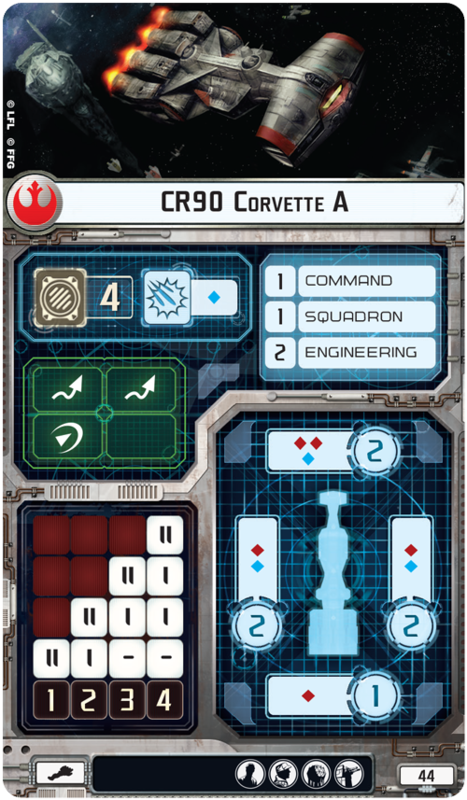 As your fleet engages your opponent's, it's your job to ensure your ships and squadrons are all provided the right commands. You direct their movement. You balance your defensive and offensive tactics against your need to complete objectives. And all of this means planning multiple steps in advance. The Star Destroyers, Mon Calamari star cruisers, and other capital ships at the heart of Armada aren't quick and nimble like the starfighter squadrons that buzz all about them. They're massive, lumbering vessels that need time to adjust. Getting them into the right position at the right time requires anticipating your opponent's moves, as does making sure your crews are ready to take the right actions. This is where Thrawn comes in. The striking, blue-skinned Chiss is almost unparalleled as a tactician. Even without the powers of the Force, he's able to anticipate his opponents' moves, using his studies of their history, philosophy, and art. He aims for an understanding of his opponents' deepest desires, using it to play upon their weaknesses, and he's patient enough to allow his foes some smaller victories in order to win the larger war. 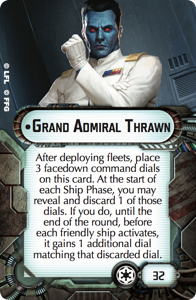 In short, Thrawn is, in many ways, the epitome of what every Armada admiral aspires to be, and his inclusion in your Imperial fleet ensures that you'll immediately reap the rewards of his foresight. And Thrawn's foresight is just the beginning of all that Wave VII has to offer! 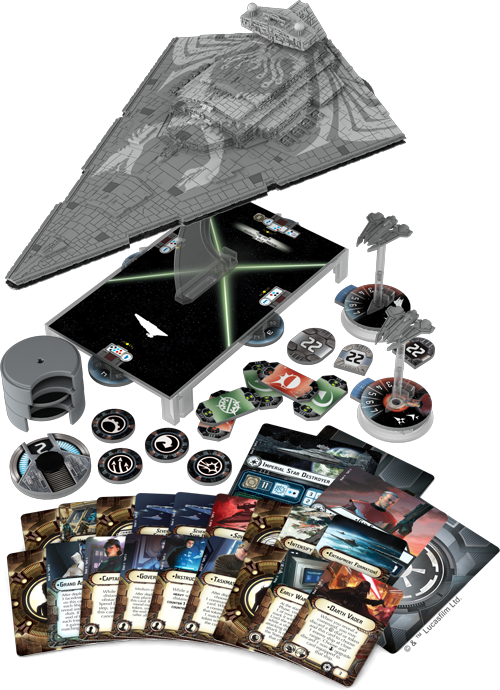 In addition to the new Grand Admiral Thrawn commander card, the Chimaera Expansion Pack introduces a new Imperial Star Destroyer, adorned with Thrawn's stylized chimaera, two Mandalorian Gauntlet squadrons, six ship cards, two squadron cards, and seventeen other upgrade cards. The first thing you might notice about the new Star Destroyer from the Chimaera Expansion Pack is that it looks different from that in the Imperial-class Star Destroyer Expansion Pack. This is thanks to its distinctive chimaera design. 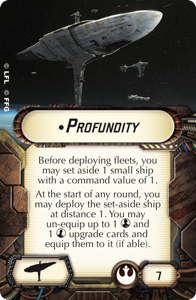 But the physical, aesthetic differences between the two miniatures only begin to hint at the differences in the strengths that they bring to your fleet. 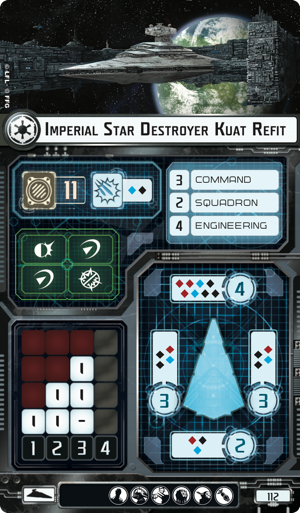 Where the Imperial-class Star Destroyer Expansion Pack gives the Imperial I-class Star Destroyer and the Imperial II-class Star Destroyer , the Chimaera Expansion Pack gives us three copies each of two different refits, the Imperial Star Destroyer Kuat Refit and the Imperial Star Destroyer Cymoon 1 Refit . Both these Star Destroyer refits feature new upgrade bars that may lead to significant changes in the way you fly your fleet. Maybe you'll only make a minor tactical adjustment. 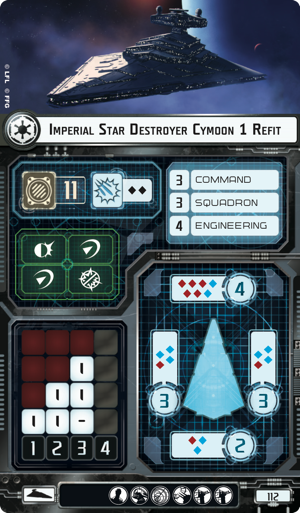 Maybe you'll adjust your entire strategy to accommodate the Cymoon 1 Refit's ability to equip any of the expansion's three Fleet Command upgrades. Maybe you won't even take advantage of the new upgrade potential, but simply by gaining the option, you place yourself in a better position to respond to your foes' tactics, and make it harder for them to anticipate yours. "This is Admiral Raddus of the Rebel Alliance. All squadron leaders report in." 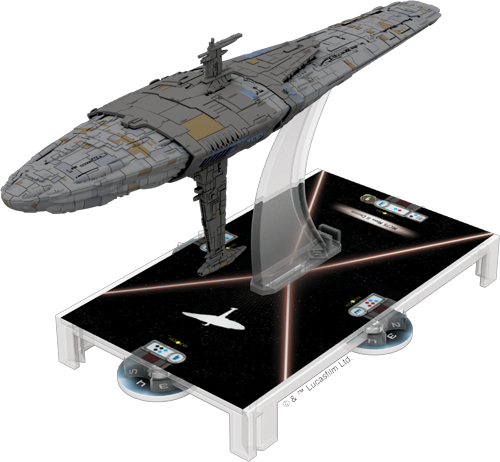 Where the Imperials gain the Grand Admiral and a number of other characters from Star Wars Rebels in the Chimaera Expansion Pack, the Profundity Expansion Pack offers the Rebels access to the MC75 star cruiser, Admiral Raddus, and Jyn Erso, as well as other notable characters from Rogue One: A Star Wars Story. 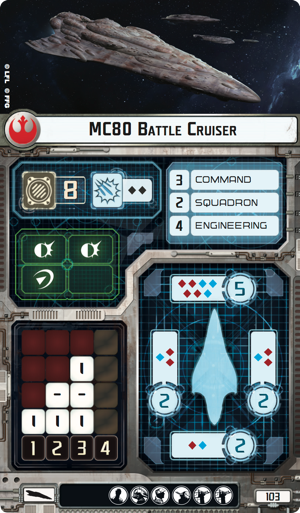 All told, the expansion allows you to field its hulking MC75 cruiser miniature using either of two ship cards, then affords you a wide range of tactical adjustments with its fourteen upgrade cards. With its punishing arsenal, powerful shields, and resilient hull, the MC75 cruiser is bound to make a massive impact upon any battle in which it takes part, but it's only to be expected that certain commanders may use the ship more effectively than others. 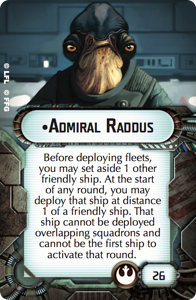 And there's likely no commander better suited to making sure your MC75 cruiser hits for maximum impact than Admiral Raddus . As in Rogue One, when his decision to support Cassian Andor and Jyn Erso drew the full strength of the Rebel fleet to Scarif, Admiral Raddus has a habit of bringing reinforcements into your Armada battles, just when it looks like everything's going wrong. At the beginning of the game, Raddus can designate any friendly ship other than his to be set aside, and until that ship finally arrives, your forces will be outnumbered and outmatched. Even if you and your opponent haven't yet begun trading shots, you'll still have forfeited a valuable action with which you could have been baiting your opponent's ships out of position. But while your forces might temporarily suffer from the absence of any ship Raddus sets aside, they'll rejoice when it arrives. Since it can come in at distance "1" of any friendly ship—and since it can face any direction when it arrives—you'll be able to bring it onto the battlefield wherever it can function most effectively. 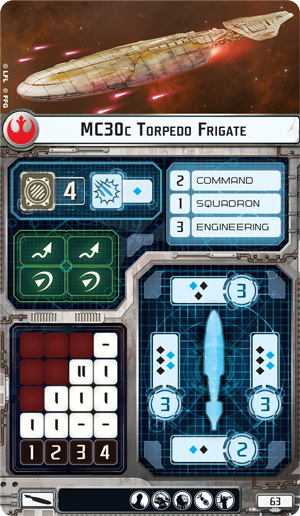 You could bring an MC30c Torpedo Frigate out of hyperspace in a position that it's already able to catch its target with a full complement of attack dice. 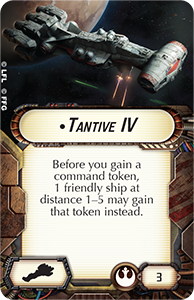 You could bring the Tantive IV into the battle in position to assign an engineering token to your damaged MC80 Battle Cruiser . 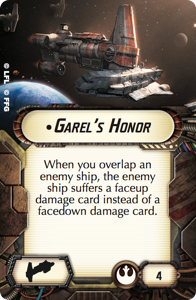 Or you could fly Admiral Raddus aboard the Profundity , race your CR90 Corvette A around the enemy's flank, and bring both your Mon Karren and Garel's Honor into the battle positioned at your enemy's back. 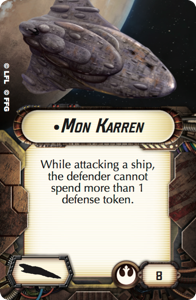 Capital ships, commanders, and far-sighted strategies. These are the heart of Star Wars: Armada. They fuel every missile barrage and every burst of cannon fire you enjoy, they propel you toward your objectives. With its new ships and commanders—and with all the new far-sighted strategies they can empower—Armada Wave VII marks a thunderous return to the core of the action. 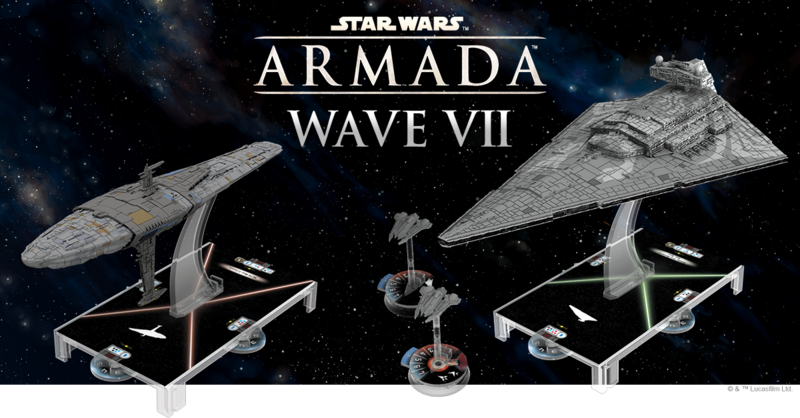 Look for the new ships, squadrons, commanders, and other upgrades from Armada Wave VII (SWM29, SWM30) to arrive at retailers everywhere in the fourth quarter of 2017!